Explore God’s plan for every believer; view or listen to the following. the Holy Spirit’s work of SPIRITUAL BAPTISM.Spiritual baptism takes place at the point of salvation, at which time a believer is united with Christ (Romans 6:4-6; Colossians 2:12), receives the gift of the Holy Spirit (Ephesians 1:13-14), and is placed in Christ’s body (1 Corinthians 12:11-13). Christ´s BURIAL AND RESURRECTION.In water baptism the believer gives public confession to the great gospel truth that Jesus Christ paid the penalty for his sins by dying on the cross. Baptism pictures that the believer’s old life was crucified with Christ when Christ died for his sins, that he was buried with Him, and that he has arisen to a new and eternal life with Christ. 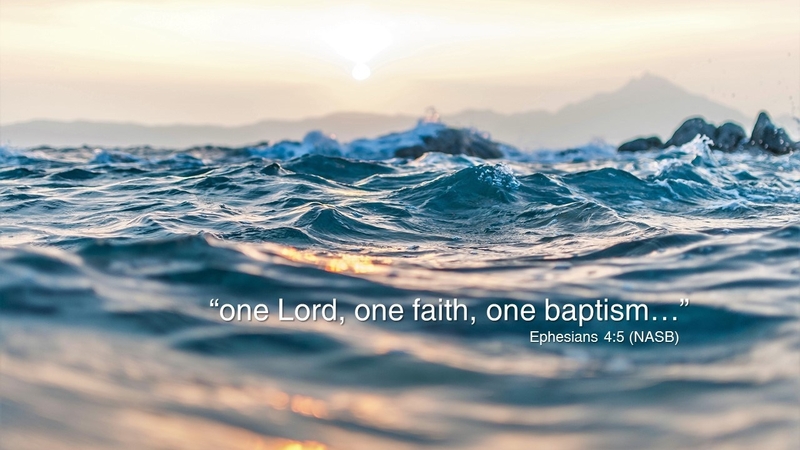 The Greek word for “baptize” literally means “to be dipped or immersed,” and because of this and the pattern illustrated in the New Testament, baptism should normally occur by immersion in water (Acts 8:35-39). Parents are primary when it comes to the spiritual development of their children. This is why the Bible places such strong emphasis on parents investing in the lives of their kids (Deut. 6:4-9; Eph. 6:4; 2 Tim. 3:14-17). Once your child really understands the gospel and genuinely believes in Jesus as their Savior from sin and Lord of their life, being baptized is a significant step in their walk with Christ. Below is a link where you can download a copy of our Baptism: Taking a Closer Look–A Parent and Child Workbook. This booklet will help you have meaningful conversations with your child about what baptism is, and why it is important. May our Lord encourage you as you disciple your child to follow Jesus for a lifetime. A booklet may also be picked-up at the WELCOME DESK, SOUTH FOYER or at the FELLOWSHIP KIDS WELCOME DESK, NORTH FOYER. If you have further questions, or are interested in being baptized, click here or contact our office, 254-848-7200. Are you interested in being baptized? Complete the following form, and you will be contacted shortly by a pastor or ministry leader, who will guide you through this next step in your spiritual journey. If a child, please provide name of parent or guardian.